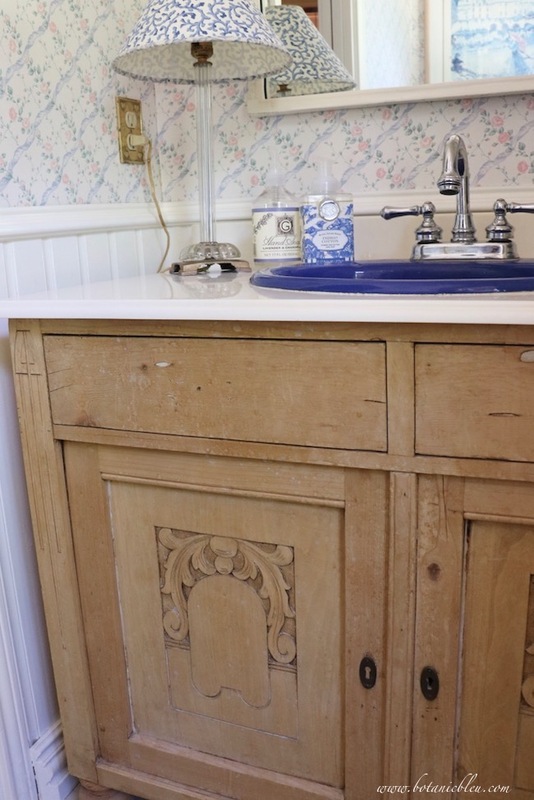 I considered the broken marble top a plus because I was torn over the idea of cutting a hole in a vintage washstand's top to add a sink and cutting a hole in the back for water pipe connections. Since the marble was broken, converting the washstand into a vanity would not damage the top and reduce the washstand's value. 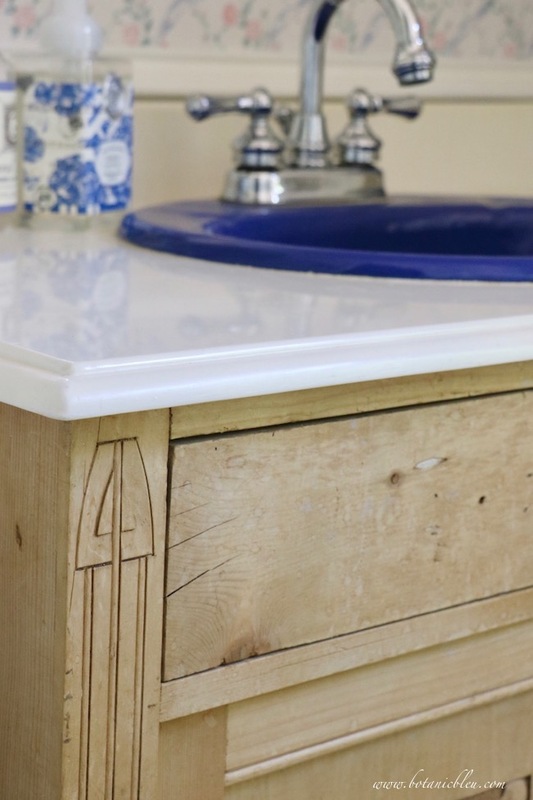 Finding a damaged vintage piece was the perfect solution for using it as a guest bathroom vanity. We got the best of both worlds, a vintage vanity without damaging an antique. Since we were building our new dream home, we were watching our budget closely. A new marble top was too expensive when we built. Instead we chose to buy a custom-made cultured marble top to replace the original broken marble with plans to buy a marble top later. Another advantage to the cultured marble top besides cost was being able to select a pure white top with a custom-made ogee edge. Look at the beautiful details in the curved edge. Would a genuine stone marble top with veining be beautiful with the vintage pine? Of course, since a marble top would be more authentic to a vintage piece than the budget wise cultured marble. 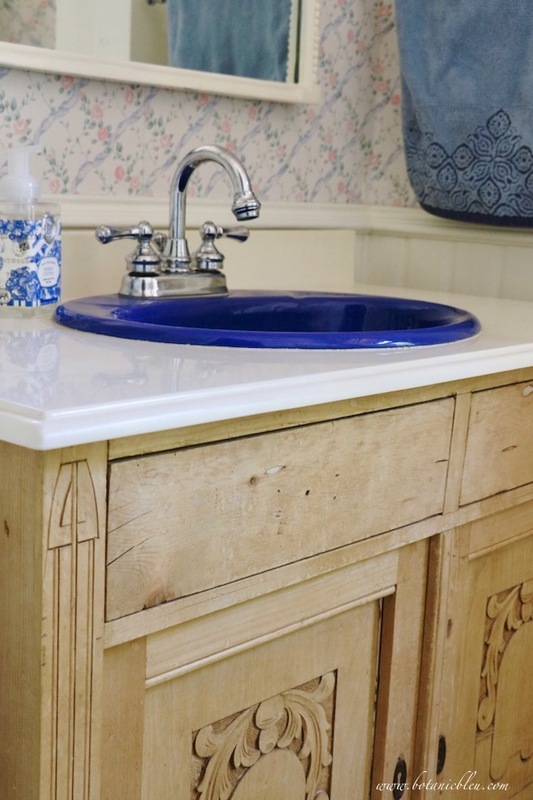 All in all, I think the cultured marble top looks good with the vintage pine washstand and does not detract from the beauty of the old washstand. The cultured marble top has looked so good over the past 31 years, we never got around to replacing it with a marble top. See the reflection of the blue label? There is still a nice shine in the countertop, and the color is still bright white after all these years. The countertops in our master bathroom are also white cultured marble. However, they had to be replaced about 10 years ago because the built-in sinks yellowed and cracked around the sink drains. We replaced our master bath countertops with new cultured marble countertops, but installed porcelain sinks instead of built-in cultured marble ones. 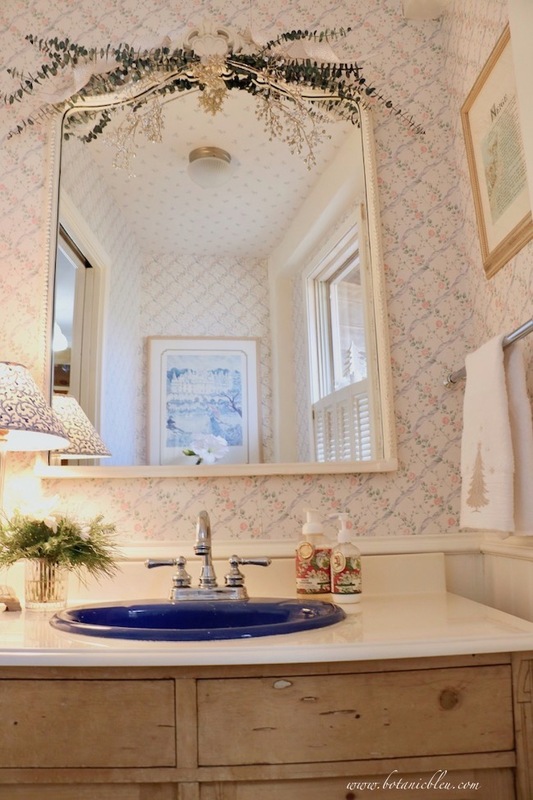 Our master bathroom sinks and countertops are used daily, but the guest bathroom with the vintage pine vanity is used much less frequently and has always had the blue porcelain sink instead of a built-in cultured marble sink. The small master bath vanity area is currently undergoing another mini-makeover. You can see the hole left from moving a wall switch farther to the right. Another update post about the progress is coming soon. When budgets call for budget wise countertops, a cultured marble countertop can be a good alternative to more expensive marble, quartz, granite, and wood. You can still have a nice-looking countertop and stay within your budget by paying attention to the details. Ogee edges and porcelain sinks make the difference between a plain cultured marble countertop and a countertop with style. 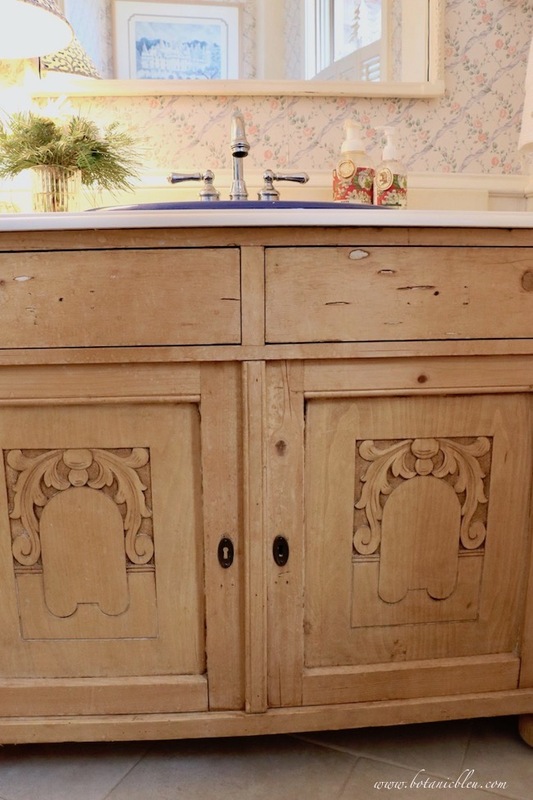 Someday the guest bathroom's vintage pine washstand may be updated with a genuine marble top if the cultured marble top begins looking shabby. It looks beautiful and I love the cabinet. You have very good taste in decorating. I am enjoying this series and tips on decorating. It is always a joy to see the details of your classic French style home! I love that wash stand! Such a beautiful piece of wood. 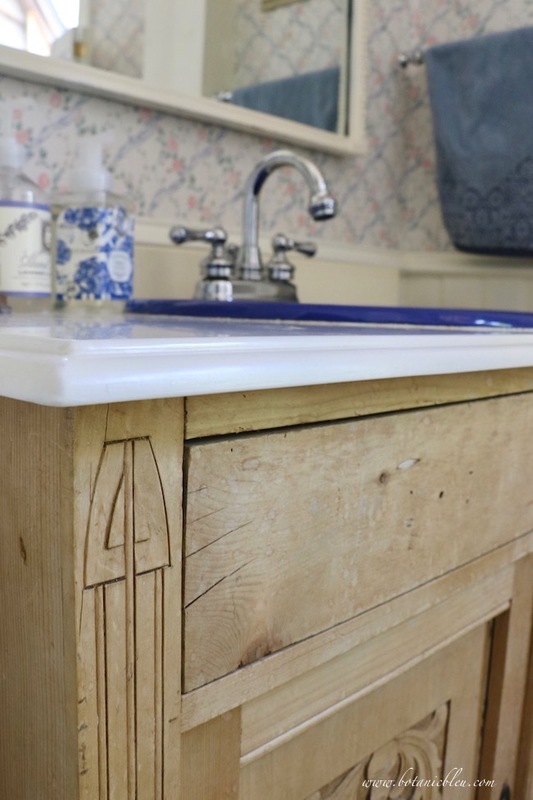 Your washstand is gorgeous! I love all the pretty details. Love your carefully selected pieces and products. You’ve got skills! Very French! Oh, Judith - what a gorgeous piece! I love how you used it. I have an antique dresser and have been dying to try something like this. Love it. I hate to ruin the piece I have.....but is it really ruining it if we transform them into part of our home? Perhaps not. And I was given this piece free. Only problem is it is holding a ton of stuff in my office - so just not sure. :- ) Time will tell - but I must say that you have truly inspired me to consider it once again!! TY! This turned out beautifully, Judith. Love the white with your cabinet! I think you are blessed that your cultured marble in the guest bath hasn't yellowed. All our CM turned ghastly colors over the years. Our bathtub was the worst. Your antique vanity is really perfection. 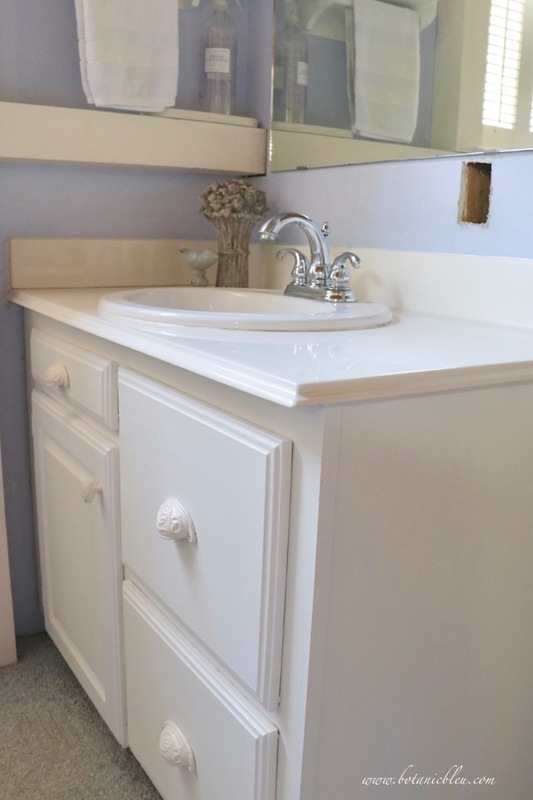 It looks like the vanity in your bathroom is turning out amazing. I love the drawer pulls. Thanks for another great series linked to Keep In Touch.